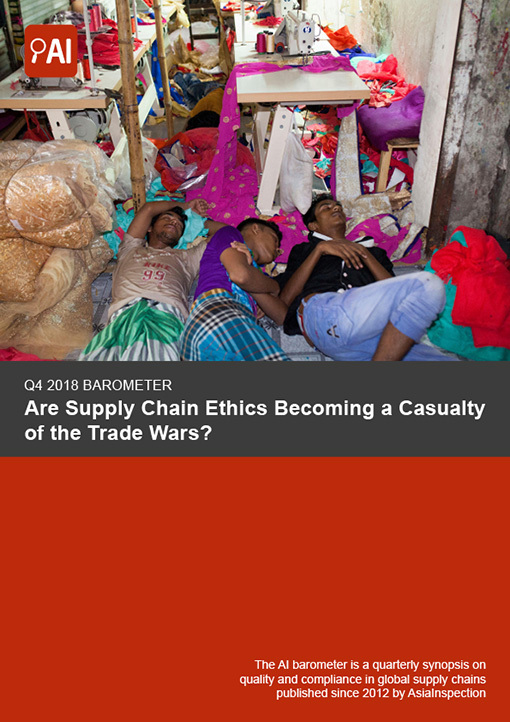 Are Supply Chain Ethics Becoming a Casualty of the Trade Wars? As Asia’s manufacturing hubs are ramping up production for the upcoming holiday season, this quarter’s barometer paints a picture of increasingly diversified global sourcing and some worrying trends for sustainability. In addition to the data collected from tens of thousands of inspections, lab tests and audits, it includes key insights from the recent AI Mid-Year Survey of companies involved in global supply chains. Data collected by AI civil engineers during on-site structural audits points to a slow pace of improvement in the state of factory safety. During the three quarters of 2018, 3.5% of factories were determined to be in need of immediate improvement and posing imminent risk to worker safety, and only 27% of factories were ranked as “Green” or fully compliant from the structural point of view. The overall trend of 2018 so far compared to 2017 shows a consistent increase in the share of “Amber” factories (that show no immediate risk but need improvement in the medium term), which may indicate that brands and manufacturers are gradually growing complacent, reluctant to improve further after meeting “good enough” safety requirements. 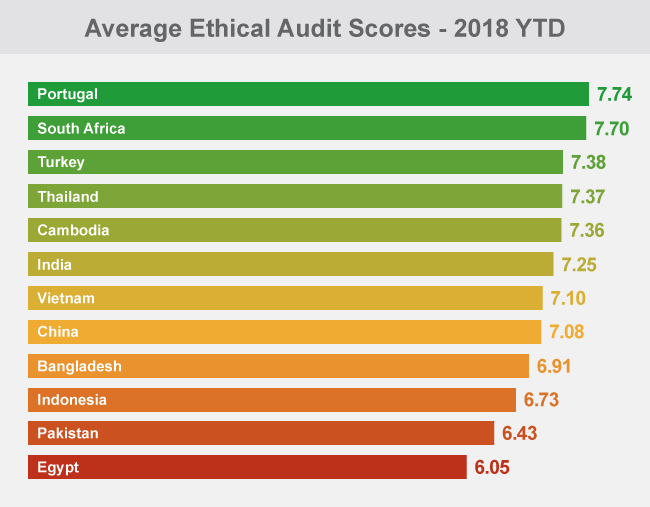 Meanwhile, similar complacency trends are echoed in the ethical scores recorded by AI auditors during the first three quarters of 2018. Most of the year-to-date improvement of overall factory scores took place early in the year, with progress stagnating from Q2 2018 onwards, as tariff and protectionism concerns took center stage. In terms of specific ethical issues, working hours and wages remains the most pressing problem (with the lowest average score of all issues at 7.2/10) – but 2018 saw waste management also being firmly established among the most critical issues, with lowering scores in this category being driven less by actual deterioration than by tightening standards. Despite the ongoing tariff face-off with the US, China’s demand for inspections and audits shows sustained growth by +7.5% in 2018 YTD, remaining ahead of the revised 6.5 percent forecasted growth rate.i So far, the manufacturing giant displays resilience amid the trade escalation, and remains confident in its status as a top sourcing destination. Indeed, the findings of the AI Mid-Year Survey indicate that China remains among the TOP3 sourcing countries for over 90% of respondents worldwide – while the dependence of North American and European buyers on China has actually increased in 2018 compared to the previous year. On the micro level, Chinese businesses appear to be taking a somewhat relaxed attitude towards the trade war: among the survey respondents, only 36% of Chinese companies said they felt affected by new US-China tariffs, compared to almost 60% in the US. Nevertheless, geographical diversification of sourcing is underway, driven by the need for cost optimization that predates the current tariff battles. Among the respondents of the AI Mid-Year Survey, up to three-quarters of businesses said they were already looking for suppliers in new countries, or had plans to do so in 2018 – and some of China’s long-standing competitors are emerging as their top choices. In Southeast Asia, the popularity of Vietnam and Cambodia is confirmed by the double-digit growth observed by AI in these countries in Q3 2018. Meanwhile, a notable portion of companies working in the cost-sensitive Textile sector have mentioned plans to expand their sourcing to other Asian manufacturing hubs, with AI Q3 2018 figures showing notable growth in Bangladesh and Turkey, where textile inspection and audit volumes expanded by +22% and 45% YTD, respectively. Asian Powerhouses Finally Competing with China on Product Quality? AI data gathered during on-site product inspections indicates that despite a brief rebound earlier this year, made-in-China manufacturing quality continues to slip. 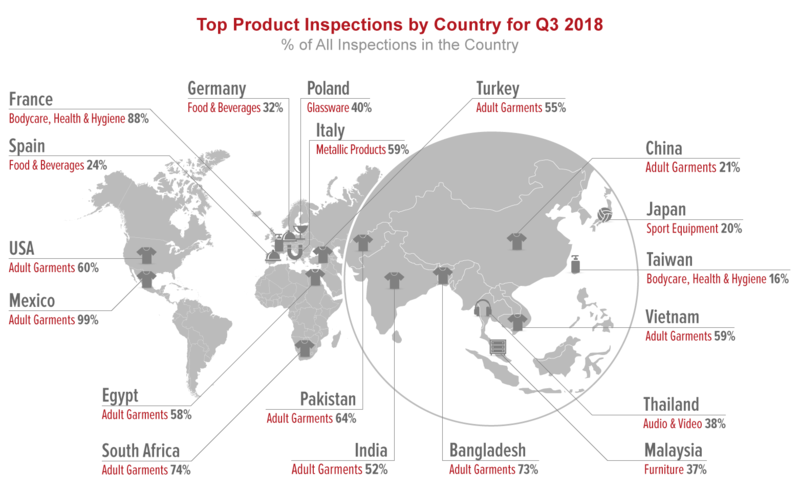 In Q3 2018, 21% of inspected products were found outside quality specifications, keeping with the long-term trend towards gradual quality deterioration that, if left unchecked, often manifests in a problem known as “quality fade”. By contrast, manufacturers in the rest of Asia have made strides to improve product quality, making themselves more competitive for businesses that seek to diversify their sourcing. 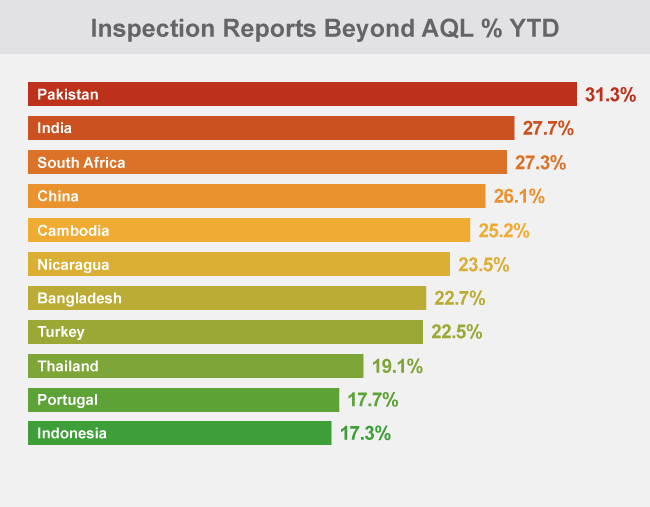 Most notably, both India and Bangladesh, historically poor performers on quality, have successfully kept inspection failure rates below 30% through the first three quarters of 2018. Meanwhile, lab testing data shows uneven performance in terms of chemical compliance of products. While overall compliance with REACH regulations has consistently improved during 2018, manufacturers still struggle to keep certain substances within the mandated thresholds: specifically, 6% and 7% of products intended for the EU failed the tests due to excess levels of phthalates and lead, respectively. Suppliers to the US fared somewhat better on the lead front (4% failure rates), but their failure rates due to banned phthalates have been hovering around the 9% mark for over a year now, with no notable improvement. Despite this failing, a positive trend for product safety is emerging in the scope of the Toy industry, where suppliers to the US appear to manage their chemical compliance better compared to other sectors. The failure rates of toys and juvenile products due to excess lead content and presence of banned phthalates are not only lower than the cross-industry averages (at 2.5% and 7%, respectively), but also consistently decreasing in the long term.